One of the most basic musical components is rhythm. I often catch my kids tapping or hitting things in a steady beat. Kids seem to instinctively be drawn to rhythmic sounds. So, it’s a great place to start when doing music activities. All three of these types of rhythm are ripe for young children to experience. One great way to start is “echo clapping”. In this activity, the adult claps a certain pattern of notes, and the kids echo it. When working with a group, an easy way to make sure the kids don’t start clapping until you finish is by signaling them with your hands. Clap the rhythm, then turn your hands towards them, palms up. That lets them know that they can start. Start with simple patterns (4 even claps, for 4/4 time, 3 for ¾, etc.) and then add beats in between as half notes. You can vary the patterns for kids who are more advanced, and of course older kids love having a turn clapping their own patterns for the other kids to imitate. You will end up moving through all of the three different kinds of rhythm in this activity, starting with the basic pulse of the music and ending with groups of notes in a pattern. Variations on “echo clapping” include using the floor and your lap to tap on, snapping, and any combination of these with clapping. For older children who have some music knowledge, you can write (or have them write) rhythmic patterns on a dry erase board or chalkboard. They can draw notes without worrying about the actual pitch; all they need to indicate is the pattern of notes. First, they’ll have to decide what time signature (or grouping) to use; 4/4 is easiest to begin with. They need to make sure that whatever notes they choose (quarter, half, whole, etc. ), the total of each phrase adds up to the top number in the time signature. One favorite rhythm game is to have one person leave the room, then pick a “leader”. Have everyone start clapping at a slow, rhythmic pace. Call the person back in the room. They have to join the circle and try to figure out who the “leader” is. The leader should change the method of making noise – tapping the floor, shoulders, snapping, etc., and when the other group members notice the leader doing something different, they should change too. The key is, they shouldn’t look right at the leader as to not give away their identity. Let the person who left the room have three guesses; let the leader go out of the room for the next turn. When you sing a song (or play one on CD), clap along and have kids try to figure out if it’s in 4/4 time or some other time signature. You can also give kids rhythm instruments (rhythm sticks work well for this) and have them tap along to the song. Use one of the sticks to “conduct”, so that they stay on the beat together. You’d be surprised how easy this is even if you have no musical experience! 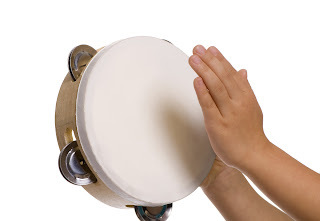 The most common musical instruments for kids to play in a group are rhythm (percussion) instruments. These include rhythm sticks, the triangle, sandpaper blocks, tone blocks, shakers, xylophone, bells, tambourines, and others.